The Series 541 sliding door has been successfully tested for compliance with AS 2047. This sliding door 102mm frame with 26mm thick stiles. The Series 541 sliding door provides an optional meeting stile strengths cover a large variety of design wind load areas. The meeting stiles in this sliding door have been designed to withstand high wind loads, and equally important the lock stile has enough body strength to carry the lock and not flex excessively while opening and closing the sliding door. This sliding door provides two heavy duty sill options - one for standard water performance and a slightly taller sump type sill for high water performance. Low line nursing home sill option also available for this sliding door. Flydoors slide on the outside and run on large diameter wheels. 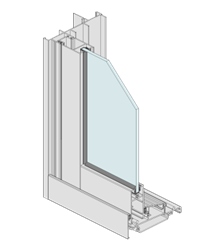 Glass door external meeting stile has built-in interlock to accept the flydoor interlock. Sliding door panels can be re-handed on site (slide direction reversed). Sliding door panels can be glazed with thick or insulating glass units. Optional tall bottom rail available. High water resistance of 300Pa allows these stacking doors to be installed into most residential projects. Series 542 stacking doors can be fabricated as ‘XXF’, ‘FXX’, ‘FXXXXF’, ‘XF’, ‘FX’, ‘FXF’, ‘XFF’, ‘FFX’ and ‘FXXF’. The accompanying optional stacking multi-panel external flydoor system is snapped to the main frame. This applied flydoor system may not be required on high rise apartments. The 109mm wide perimeter frame on this stacking door will couple to a large variety of Vantage adaptors. Flat external fillers creates a clean closed-off frame appearance. On the sill, the infills guide water away from the door panels and improve water resistance. Unused internal and external frame recesses are closed with snap-in flat fillers for improved appearance. Heavy stacking door panels can be fitted with double bogey wheels for smooth long-term operation. Running rails can be replaced in the future if necessary. Stacking doors can be fitted into commercial type sub-sill for higher water resistance. Flydoors are fitted with snap-on interlocks for improved appearance and labour saving. 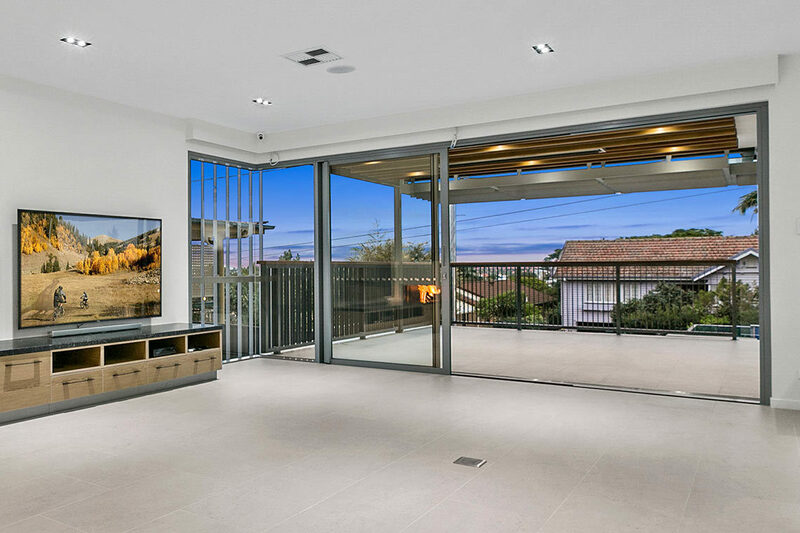 The Series 618 sliding door designed to complement the MAGNUM™ window systems. 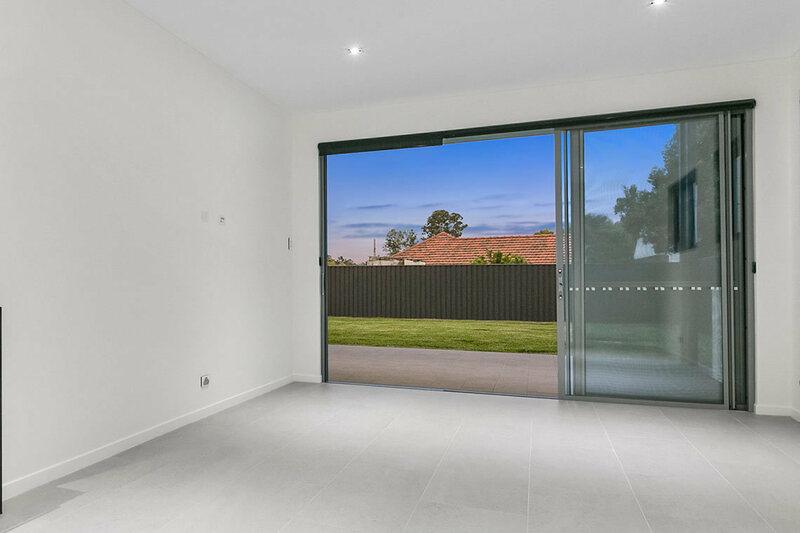 The standard sliding door frame is 133mm wide and will snap to the 102mm wide MAGNUM™ window frames without unsightly screws or rivets. 44mm and 50mm high flat sills are ideal for recessing this sliding door into the floor. 44mm jambs and head match the standard 44mm flat square sill. The 33mm thick stiles are ideal for extra large sliding doors in high wind load areas. Full height doors (2900mm) remove the need for highlights in most applications. This sliding door achieves very high water resistance. Reinforced frame legs are designed to retain the door panels in high wind load areas and help us achieve the high ultimate ratings. The accompanying optional stacking multi-panel external flydoor system nests into the main frame. The custom screen door system is designed to complement the glass door. The high water resistance of 450Pa allows these doors to be installed into most residential projects. Meeting stiles on this sliding door is fitted with custom end closers that restrict water turbulence under extreme conditions. Unused frame recesses are closed off with snap-in flat fillers for improved appearance and water resistance. 90º corner opening sliding door available. 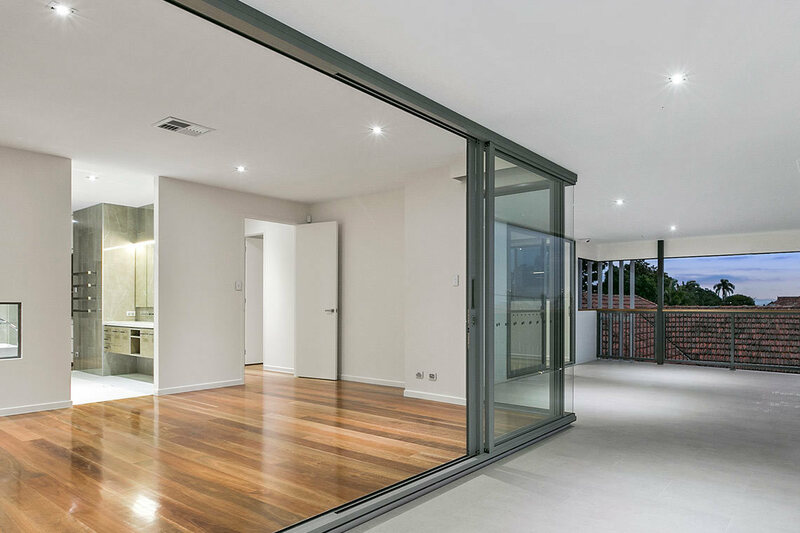 The Series 704 high performance sliding door has been tested for compliance with the relevant Australian Standards. This sliding door has a high water resistance of 450Pa and complies with the air conditioning requirements of the standard. The Series 704 sliding door is compatible with the high performance Series 406 / 606 and 426 / 626 FrontGLAZE™ framing. These sliding doors can be fitted with surface mounted deadlock, mortice lock or multi-point mortice lock. Series 704 sliding doors run on heavy duty double bogey wheel carriages. Sliding doors can be fitted with internal sliding or roller flydoors. Series 852 sliding door is an innovative thermally broken aluminiun commercial door system designed to complement the Elevate™ Commercial thermally broken CentreGLAZE™ and FrontGLAZE™ framing systems. 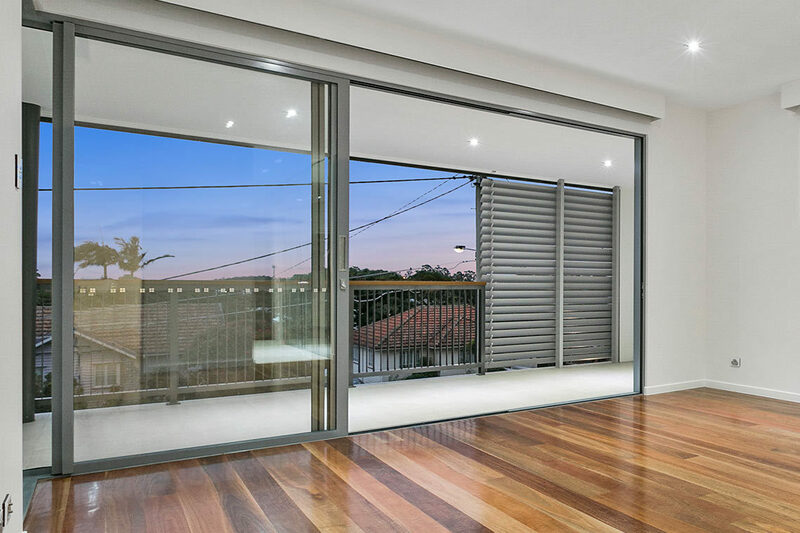 Incorporating ThermalHEART™ technology, Series 852 sliding door delivers excellent thermal performance and is ideal for commercial and high-end residential applications where minimising heat or cold transfer is desired. 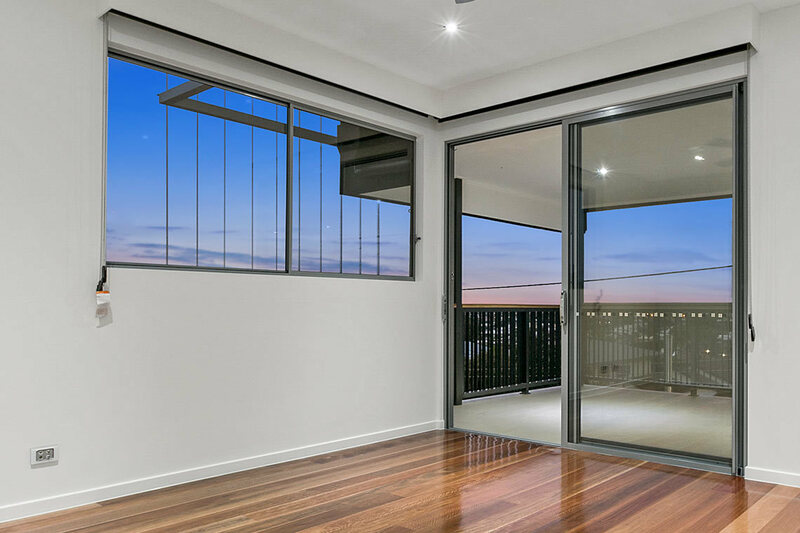 To ensure excellent thermal performance ise achieved, a "Thermal Break" is incorporated into this sliding door which separates the inside and outside elements of the frame providing an insulator to minimise the transfer of heat or cold between the elements. This insulating strip in this sliding door is manufactured from polyamide and delivers the same structural properties as aluminium to ensure the integrity of the sliding door is maintained. Series 852 Commercial Door system incorporated fully beaded 50mm thick heavy duty door stiles and rails designed to accept 24mm IGUs. The sliding door stiles have been designed to accept wide backset (34mm and 38mm) locks. The greater the backset the easier it is to access the key. 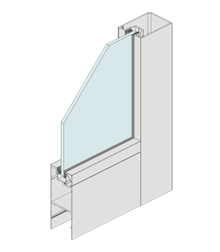 Captive co-extruded glazing wedge option (illustrated) reduces the chance of vandalism on this sliding door. Heavy duty bottom rolling running gear or alternative Centor E3 top-hung rollers deliver smooth reliable operation. This sliding door can be configured as a sliding or stacking sliding door with top-hung or bottom rolling options. It can also be configured as hinged or pivot door. This sliding door can be fitted with Centor S1E Eco Screen.